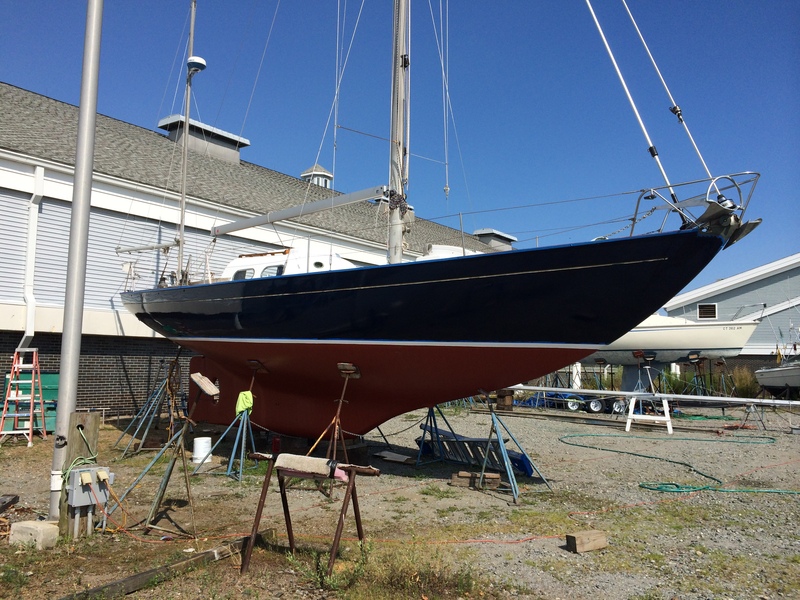 First coat of Flag Blue Brightsides to Scout’s topsides. 2 more coats to go. *The rigging is done, it took forever, but Brian and I lifted the boom into place yesterday, it still needs to be tuned but so far, it makes me think we own a sailboat again. *The propeller finally arrived! We test fitted it today, and at least it looks good, I guess we will finally know when we are in the water and trying to move forward! *I spent all week prepping the topsides (the blue part of the hull) so we can finally have a respectable looking boat again. This morning the first coat of Flag Blue Brightside went on, what a difference it makes. Now do not look too closely to the pictures because we are amatuers but for a first coat, no so bad. Tomorrow morning I will be sanding again, getting ready for coat #2. If the weather continues as predicted, this should be done by Sunday. The only painting from that point will be the gold cove stripe. *Brian is in process of making the dinette table, again a work in progress. Most of the things redesigned or built on the boat are created from his imagination. He makes styrofoam templates for everything, test fits it, then redesigns again. The whole dinette area is his creation from start to finish, and I am still in awe of what he has done so far. *Engine should go in on Monday, and then Brian will be working on it for the next 3 weeks hooking up all of the systems so they can function as one. *And the company creating our Dodger (the canopy under the boom but over the cabin) will be there next week as well to start bending metal for the frame! All in all a good week! I spent a little time today make a progression movie of the hull and rudder, not bad for a first attempt! Hopefully, as I figure the program out, there will be music and more to see! I am amazed at all you have accomplished, you both should be very proud of yourselves. I look forward to the end result. Congratulations!